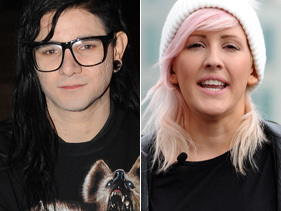 of the nearly year-long relationship between Skrillex and Ellie Goulding was amicable. Proof? Skrill dropped a new video for the song "Summit" this week, a collaboration with his ex, on the same day that he also released a new three-song EP on YouTube. The Leaving EP, which was put out through his label OWSLA's subscription service, the Nest, features brand new tunes, the reggae-like grinder "Scary Bolly Dub," midtempo dance tune "The Reason" and the chill down title track. "I made 'Leaving' in my hotel room in Mexico and just finished 'The Reason' an hour ago in my hotel room in Miami," Skrillex said in a statement accompanying the new songs. "I guess it's just kind of a reflection of how I'm feeling right now." He also noted that "Scary Bolly Dub," has been part of his live DJ sets for a while. Though the "Summit" video opens with a series of images of a young woman putting on lipstick, smoking and staring into the camera lustily, the Goulding hook-up does not feature any images of Skrill's former life co-star. Instead, it focuses on some young partiers skateboarding, hanging on the beach, trying on whip cream mustaches, lighting their hair on fire, making out, taking glitter baths, eating sushi, blowing smoke rings and just generally glamorously wasting time. Despite dropping the new video and EP, the hard-touring dubstep star toldBillboard that he's planning to take some time off in 2013 to work through the massive pile of new music he's accumulated. "I have so much music. I have too many songs to even know what to do with," said the three-time Grammy winner, who is nominated for another trio of awards this year. "I just always make music anyway... But I want to make a record. I just haven't had enough time to really sit down and idle myself and clear my mind and go, 'OK, what's the next thing I want to say? How's it different from what I said before?' and think of all these things. I have so much inside me, so many ideas, I'm more excited than ever to make music again, 'cause I haven't done that for, like, two years." and possibly some more film scoring work after positive experiences working on tunes for "Wreck-It Ralph"
and the upcoming "Spring Breakers."